A must-have tool for anyone vaguely serious about recording. The ability to edit pitch, time, formant and volume of polyphonic audio. This could make us lazy musicians! There may be some of you already familiar with Melodyne. For the uninitiated, it's a piece of software capable of extremely high quality pitch and time manipulation, fantastic for seamlessly tuning vocals or speeding up a track while retaining pitch. Until now it's only been possible to edit a file globally. However, first shown in Frankfurt this year, Celemony's Direct Note Access (DNA) seemed to do the impossible in allowing you to delve into polyphonic audio and change the pitch and time of individual notes. 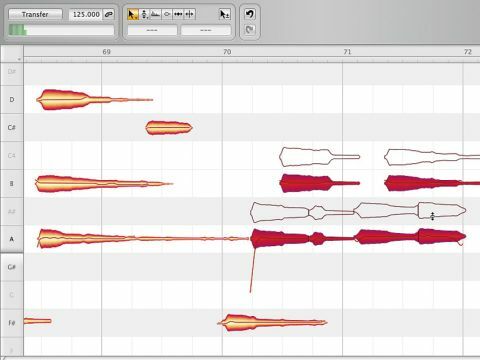 "Melodyne Editor is a revolution... it could force us to re-evaluate the way we record entirely." A full working version has been a long time coming, but the all-new Melodyne Editor is about to go into production. What we have on review here isn't actually the final version, but a second generation Beta, so there are still a few problems to be sorted. However, this product is so revolutionary we felt that it was worth getting the heads up on it. Authorisation will be either by computer registration or iLok USB key and you'll be able to use it on Macs and PCs as either a standalone or plug-in. As a plug-in, you have the advantage of hearing any changes you make with the track. When you open up Melodyne Editor, you'll need to transfer the audio that you want to edit to the plug-in for analysis. This can be part or all of the audio and playback will switch to the original if you only transferred parts. This process has to be done in real time and, once completed, Melodyne Editor puts all the notes it thinks are used onto a pitch and time grid as 'blobs' with each blob representing a note. It's not always perfect, particularly if the content is complex, so there's a slider available that will reveal more choices that can be individually turned on or off if you find you're missing something. In most of our trials, Melodyne coped admirably with the minimum of tweaking needed. We started by loading in some guitar strums. It's amazing to suddenly see all the notes appear once Melodyne has done its magic. Now the fun starts! Want to make that E minor a major? No problem, just move the G up to a G#. No glitches, no nasty overtones, it just sounds like you've played an E major in the first place! Changing a whole chord is just as easy, select all the necessary notes and move them to a new key. Straying too far from the original pitch, as you would expect, makes things sound a little unnatural, but there's a formant-changing tool to help out. Loading some deliberately out-of-tune and badly played arpeggiated guitar, we were able to get right in there and repair timing as well as tuning. Out-of-tune notes can either be shifted by whole semitones or, by holding the Alt key, in fine increments. If you find that notes are the wrong length, simply drag the end of a blob in either direction. If a note blends into another, lengthening one note will shorten the other to maintain fluidity. It's also possible to split notes and then treat them separately, thereby making it possible to change their pitch and create a new part. Melodyne Editor is a revolution. The ability to dive into polyphonic recordings and alter the pitch, timing, formant and volume of individual notes could force us to re-evaluate the way we record entirely. saying, "Don't worry… I'll just Melodyne it". This is our only worry. Will it make us lazy and stop us bothering to hone our musicianship? Only time will tell. Whatever, this is one incredible bit of software!